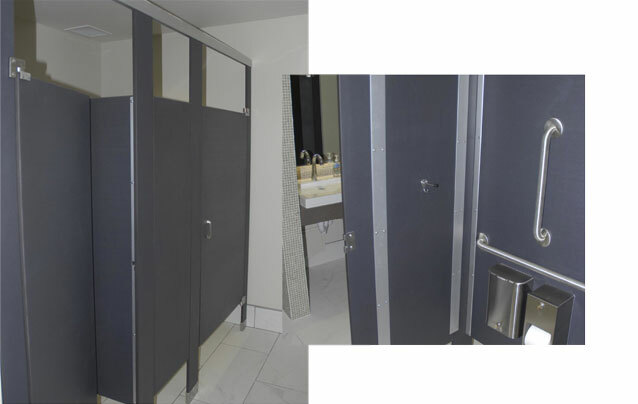 The paper composite solid surface products that represent the core components from our Toilet Partition systems play a role in enabling a project to acquire Leadership in Energy and Environmental Design (LEED) points toward certification. Our LEED supporting paper composite materials are made from 100% post-consumer recycled paper, 100% post-consumer recycled cardboard and/or 100% virgin FSC certified fibers or a mix of FSC certified wood fibers and rapidly renewable fibers. These materials are certified to Forest Stewardship Council standards by the Smartwood program of the Rainforest Alliance. MR 4.1 10% of the building materials used must be made of recycled materials. MR 4.2 10% of the building materials used must be made of recycled materials. MR 5.1 Uses at least 10% of materials found within 500 miles of job site. MR 5.2 Uses at least 20% of materials manufactured within 500 miles of job site. MR 6 2.5% of the value of the building materials used are rapidly renewable. carry the Chain of Custody. Content, Regional Materials, Rapidly Renewable Materials etc.